Furthermore, the heading behavior of the flow causes dry stuffing box packing, therefore, decreases their run life. Thus, heading is problematic and must be controlled. The most common way of stopping heading is by using a back pressure regulator or an orifice (also called back pressure valve). Heading Up for wells that have a tendency to head up and flow, a constant pressure maintained on the oil column will assure a full string at all times. 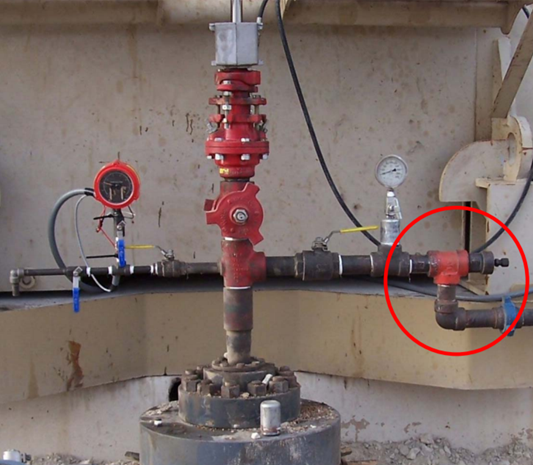 Back Pressure Regulator increases the flowline pressure to keep the gas from expanding and causing heading. Increasing the tubing pressure by 50-60 psi is often sufficient to stop heading. Furthermore, backpressure increases differential pressure across the plunger and increases the tubing fluid gradient, which allows pump action to be maintained. The back pressure valve is designed to close when the pressure is the tubing is higher than the spring valve. Although this prevents heading flow behavior, the system efficiency decreases when a BPR is installed. This is because the pump has to do extra work to push the fluid through the BPR. Therefore, additional horsepower at the pump to lift the fluids to the surface (due to the increased pressure on the pump discharge) is required and this could potentially increase the operating cost. Also, high back pressure can cause the pump spacing to change since rod loading and stretch increases when a back pressure valve is used. The change in spacing can sometimes improve the pump compression ratio in gassy wells and helps prevent gas locking in the pump. The effect of a back pressure regulator on the rod pumping system can be simulated by the RODSTAR software from Dover Artificial Lift. Tagged artificial lift, Back Pressure Regulator, Back-Pressure valve, beam pump, BPR, BPV, Gas expansion, Gas Lock, Gassy Sucker Rod Lifted Wells, heading effect, production optimisation, production optimization, pump spacing, sucker rod pump, Tubing Back Pressure Regulator. Bookmark the permalink. It is useful in moderate GOR applications, we use semi similar approach in GL wells via installing GBC gas breakthrough valves downstream the X-Tree to control amount of associated produced gas and improve oil productivities. Many thanks Mahmoud for your comment. this type of valve seems interesting in GL well applications especially in wells having slug flow behavior.